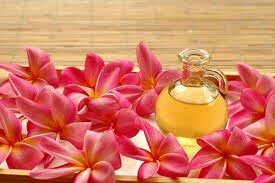 The aromatic Frangipani Absolute Oil is widely used in perfumes, night creams, lotions and various other products. Extracted from white delicate frangipani flowers, our oil is pure and available in leak-proof packaging. Our Frangipani Absolute Oil is known for its anti-inflammatory and antioxidant skin refreshing properties. We offer Frangipani Absolute Oil in bulk quantities and at affordable rates.